February 2019: We are very pleased to announce that Junior Rockhounds meetings resumed on Monday, February 18, and are scheduled to continue through May 6. The meetings have a different topic each week, such as minerals, fossils, gemstones, geology, and dinosaurs. 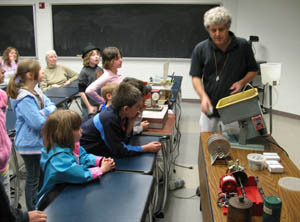 They include fun hands-on activities and discussions with an expert. Parents stay with their children, and may get a lot out of the meetings too! You don't have to be a member to attend; please come out and see what it's all about. See the information below or download the same text as part of this PDF flyer. Join the Junior Rockhounds: Rocks, Fossils, and Minerals Club! Who: You! Best for 3rd through 8th graders WITH their parents. What: Junior Rockhounds Science Club – Rocks and Minerals Programs. When: Mondays, 6:15- 7:00 p.m. No reservations needed! Spring 2019 Schedule: February 18, 25; March 11, 18, 25; April 1, 8, 15, 22, 29; May 6. Apr 29: Gemstones, and more! Parents: Please accompany your student! All materials provided free of cost. Each student gets a free plastic collection box. At each session students get specimens to add to their personal collection. Hands-on, messy, fun! Science, learning, and family fun! Collecting Field Trip/ Cave Trip (parents drive/open to all) – More info on time, date, will be announced later. Sponsored by: Junior Museum and Nittany Mineral. Society. Questions? Contact Dr. Andrew A. Sicree at aas132@psu.edu or (814) 867-6263. A gem polishing program for Junior Rockhounds.